Looking for something to help you manage your Japanese study time in 2019? You've come to the right place. We've created an awesome printable planner to keep your life and study organized. The beautiful part about creating your own Japanese planner is that you can print out the monthly and weekly sheets and put down the special dates and appointments. Over 70 pages of monthly and weekly pages to help you organize your plans in one place through the whole year. Each month is designed with a special Japanese theme and you get to know the Japanese national holidays with this planner. You can print the planner in A4, B5 or B6. All planners are printable within 24 hours after the payment. Copyright © 2018 by Kawa Kawa Learning Studio. All rights reserved. All illustrations, artwork, graphic, characters, logos, and/or design in this listing are the copyrighted works of Kawa Kawa Learning Studio. Any unlawful redistribution, reproduction, alteration, or transmission of any illustrations, artwork, graphic, characters, logos, and/or design on this site in any form or by any means, including but not limited to photocopying, downloading, recording, or other electronic or mechanical methods, without the prior written permission of the artist is strictly prohibited and punishable by Canadian, US, and international copyright laws. Looking for something to help you manage your Japanese study time in 2019? You've come to the right place. We've created an awesome printable planner to keep your life and study organized. 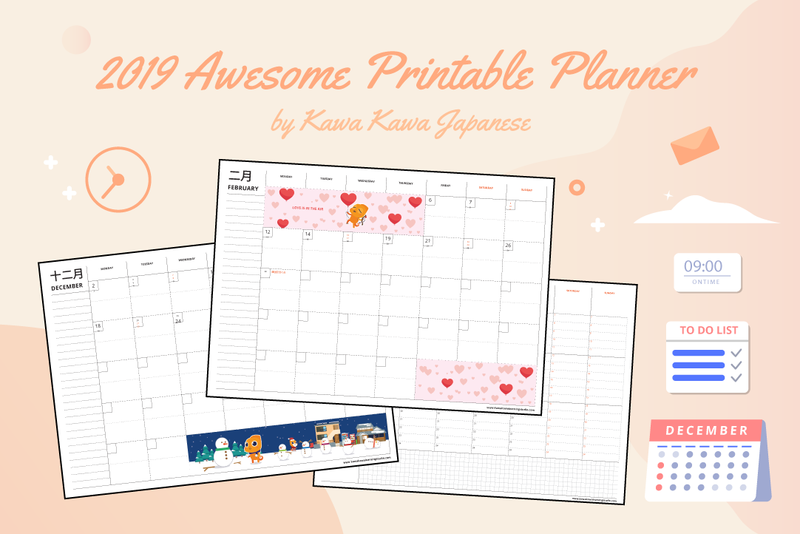 The beautiful part about creating your own Japanese planner is that you can print out the monthly and weekly sheets and put down the special dates and appointments.